There's no denying that leg kicks play a major part in MMA. If you're looking to practice your leg kicks whilst sparring, a good pair MMA shin guards are a must have piece of safety equipment. Wearing a pair of shin guards will protect both your leg and your sparring partner from sustaining any serious damage. Considering how important shin guards are, plenty of time should be spent finding the best suitable pair that will offer you the most protection and not affect your ability to move. Luckily, in this article we’ll cover a wide variety of the best MMA shin guards, designed for multiple fighting styles. If you need any form of reminder as to why you should wear shin guards, take a look at this replay of Anderson Silva Vs Chris Weidman at UFC 168. Weidman checks Silva’s leg kick, which causes it to break pretty severely. What Should I Look For In The Best MMA Shin Guards? There are a few different types of shin guards, designed for different martial arts and striking techniques. When looking to buy a pair of the best MMA shin guards, you will often find yourself in a toss up between size and manoeuvrability. A more padded shin guard will deliver you with more protection; however will provide your leg with less dexterity. All of the shin guards on our list will fall into one of these three categories, all of which are suited to different aspects of MMA. The best MMA shin guards for your needs will depend on your style of fighting and your preference between protection and mobility. Most MMA shin guards tend to have a slip on design with minimal excess material to allow maximum speed and manoeuvrability. You will notice that MMA shin guards tend to be a bit shorter than Muay Thai shin guards and without any straps, however both shin guards focus on protecting the leg and instep. MMA shin guards tend to be manufactured using extremely lightweight materials and typically feature an ankle clasp for extra support and stability. When you’re looking for the best MMA shin guards, finding the middle ground between protection and manoeuvrability is key. A tell tale sign of a good pair of shin guards is that they'll hold their place for a long period of time and not need to be adjusted. If you purchase a cheap, low quality pair of guards you'll find that you will constantly be adjusting them. Movement, speed and agility play a major part in grappling. That’s why finding a pair of shin guards that offers you a good amount of protection whilst not restricting your movement is incredibly important. When looking for the best grappling shin guards, look for an ergonomic design and stabilisation features that will allow the shin guard to attach firmly to your foot and leg. These are designed to protect both you and your partner from the high-powered leg kicks frequently thrown in Muay Thai, kick boxing and MMA. Leg straps are pretty common amongst Muay Thai shin guards. This is so that they are able to remain attached to your leg, no matter how many times you deliver or block a kick. They also tend to be longer than other types of shin guards in order to provide the most amount of protection. Due to their size and the amount of protection that they deliver, these are perfect for the striking style of fighter with leg kicks in their arsenal. First up on our list of the best MMA shin guards are the Hayabusa Tokushu Regensis, yet another top class product by Hayabusa. The Tokushu Regenesis are striking shin guards, designed to protect your shin, in step and your calf. The added calf protection strap also helps to prevent the shin guards from sliding round your leg as you kick. This is a pretty common issue with low quality shin guards and is one of the reasons why the Tokushu Renegesis are one of the best MMA shin guards. In typical Hayabusa fashion, the highest quality materials are used to produce the Regensis shin guards. They're manufactured using Vlyar-2 engineered leather that is both highly protective and long lasting. 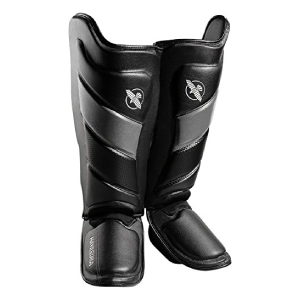 Although the Hayabusa shin guards are priced relatively expensively, you get a lot more for your money, as you won't have to buy another pair for a long time. Not only are they extra protective, but they’re also considered one of the most comfortable shin guards around. Their ergonomic design with edged contours allow the guards to fit perfectly to your leg, providing you with unhidden manoeuvrability. The shin guards feature double layered padding on the shins and insteps that allow them to withstand high impact blows and protect your legs and feet. Being designed to allow unhindered movement in the knee joint, the Tokushu Renegesis are one of the best MMA shin guards currently available. 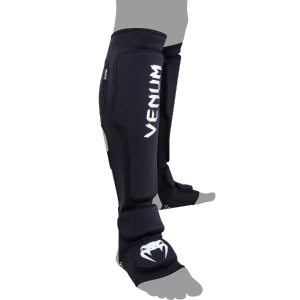 Up next we’ve got the Kontact Evo shin guards by Venum. 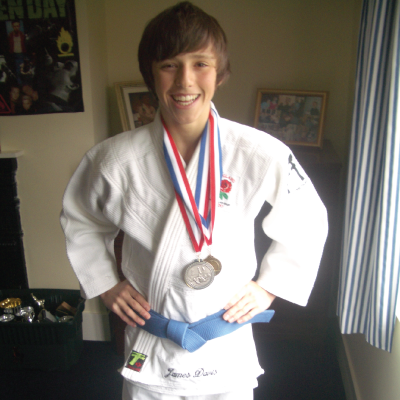 Venum are at the top of their game right now, creating some of the highest quality martial arts gear around. Their Kontact Evo shin guards are no exception. The Venum shin guards are significantly smaller than the Haybusa guards we just discussed and as such, offer wearers less restriction and more manoeuvrability. The downside to this is that the pads are slightly smaller, offering the wearer less protection. If you favour mobility over protection, then the Kontact Evo’s are the way to go, after a few minutes of sparring you’ll soon forget you’re even wearing them. They’re made using neoprene material that is both comfortable and flexible, with a mesh design that provides ventilation to the legs. Although the protection pads are slightly smaller than other models, they’re made using high-density foam that not only maintains the lightweight design of the shin guards, but also provides a serious amount of protection. The best aspect of the Venum Kontact Evo’s is their price. Costing less than $50, no other shin guards can match their value for money. Venum are one of the few companies to that don't sacrifice their quality in order to provide a cheaper product. Whether you’re a beginner or an experienced mix martial artist, you will not be disappointed with the Venum Kontact Evo shin guards. Although they may not look like much, there’s no denying that the Fairtex Pro’s are one of the best MMA shin guards for strikers. Previously, Fairtex have specialised in producing high quality Muay Thai gear, but with the MMA's rise in populairty, have started to shift their focus. 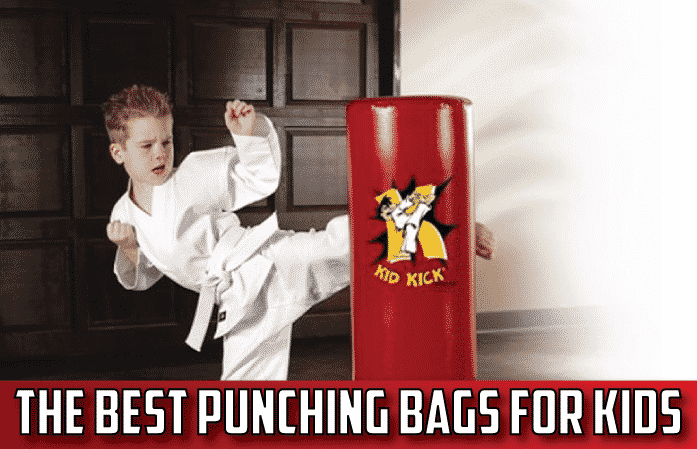 The high quality padding surrounds the entirety of the shin and instep, allowing you to safely throw and block kicks whilst sparring. As Fairtex are primarily a Muay Thai brand, their products posses the typical traits associated with Muay Thai fight gear. One such trait is that they are sized a lot smaller than other shin guards. What I mean by this is that if you are usually a small, you can expect to be a medium with Fairtex. This makes the shin guards perfect for smaller fighters who may struggle to find shin guards that fit properly and do not slip. The quality of the Fairtex shin guards is insane considering how affordable they are. Invest in a pair of these and you won’t be disappointed. 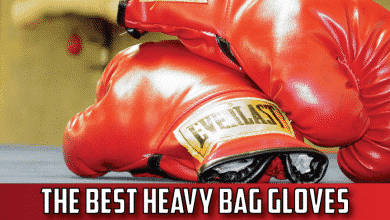 A common theme in our lists of the best MMA gear is the presents of both Hayabusa and Venum. 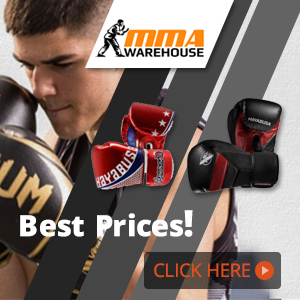 If you’re new to MMA and are overwhelmed by the number of brands and choices out there, you can’t go wrong with the shear quality that Hayabusa and Venum have to offer. As with most things in life, you get what you pay for and that couldn’t be truer than with MMA gear. Yes you can buy cheap pieces of gear, but they’ll more than likely be terrible quality and have a very short life span. Although Hayabusa is one of the more expensive brands, the quality and longevity of their products make them a great investment. The Hayabusa Mirai shin guards’ feature an award winning boa closure system that latches the guards onto your leg without any slipping or rotating. The closure system can be adjusted by twisting a button at the back. Unfortunately, this button is made out of plastic and if you plan to spar with these on, is something that you should be aware of. The ultra-wide foot loops paired with the in-step padding provide both protection to the leg and foot and stability for the shin guards. The design of the shin guards means that they can stay fixed to your leg without moving or rotating. Using the clasp located at the back of the shin guards, they can easily be loosened or tightened with one hand to suit the wearer’s needs. Not many shin guards can rival the Hayabusa Mirai’s practicality and protection, however this all does come at a cost. Unfortunately they are the most expensive model on our list of the best MMA shin guards, but as I mentioned earlier you get what you pay for. Expect a long lifetime, unrestricted leg mobility and a high amount of protection from the Hayabusa Mirai shin guards. 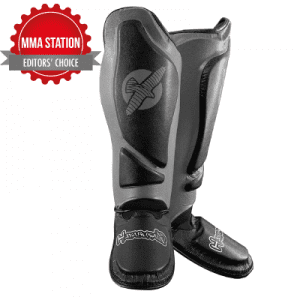 They're undeniably one of the best MMA shin guards currently available. Available in 6 different colour variations, the Venum Challenger shin guards are one of the best looking models on our list. Not only do they look awesome, they’re practical, affordable and above all else, provide fantastic protection to the shin and foot. Venum make use of durable, high quality synthetic leather that ensures a long lifetime. This material is also incredibly lightweight and is designed to allow your leg to move without restriction. The high-density protective foam that spans across the entirety of the shin and foot offers far more protection that the Venum Kontact Evo’s we discussed earlier. If you’re a Venum fanboy like me and are looking for highly protective shin guards, then the Venum Challenger’s are your solution. They also make use of 3 Velcro straps that are designed to clasp to your leg, preventing the shin guards for slipping when you’re kicking. If you’re shopping on a tight budget but still want high quality shin guards, then the Meister Edge MMA shin guards could well be your answer. Costing less than $50, they’re the most affordable item on our list of the best MMA shin guards. The ergonomic design of the shin guards allow them to fit perfectly to your leg without slipping or rotating, which you will most often find with other guards priced this affordably. The shin guards themselves are manufactured using genuine cowhide leather paired with high impact shock absorbing pads. 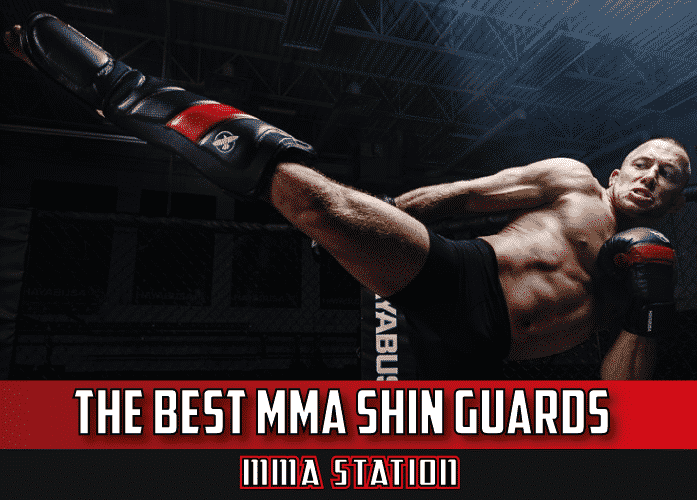 These high quality materials are both long lasting and protective, which are two of the most important aspects to consider when looking for the best MMA shin guards. What’s more, the in-step protection pad features a layer of gel-padding that adds even more protection to your foot. Three tight fitting straps are used to hold the shin guards in place and prevent them from coming off. When wearing shin guards, your feet tend to perspire a lot more than usual. This in turn makes your feet wet and more likely to slip. 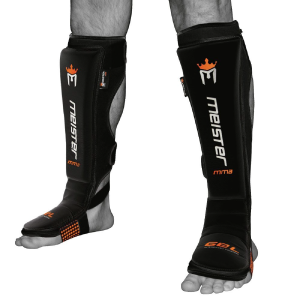 The Meister EDGE MMA shin guards feature rubber dots along the bottom of the foot strap. This helps to keep traction between your foot and the mat and prevent you from slipping. Overall it is pretty crazy how much you get for your money, making them easily one of the best shin guards for MMA. 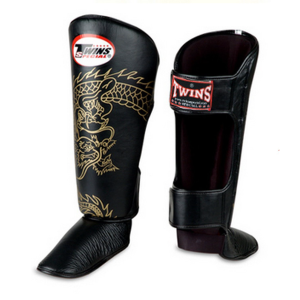 Top King are widely regarded as the best manufacturer of Muay Thai shin guards. 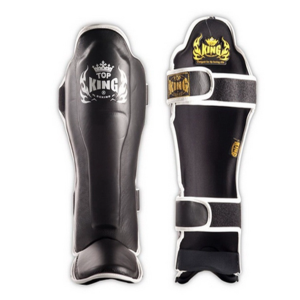 This makes the Top King shin guards a fantastic option for fighters who implement a lot of Muay Thai striking into their MMA game. Using the highest quality genuine leather, the Top King shin guards provide your entire lower leg and foot with top-notch protection. No area of the leg or foot is left exposed, allowing you to throw and block leg kicks without the fear of getting inured. One think to take into considering with the Top King shin guards is that they take a while to ‘break in’. I’ve had a few guys say to me that they haven’t liked them, then a few weeks later say they’re the best thing since sliced bread. They feature two straps that clasp tightly around the wearers leg. You will notice that the inside of these straps are a slightly different material to the rest of the shin guards. This is so that there is friction between your leg and the guards, preventing them from sliding around when you being to perspire. They’re available in 6 different colour option and designs, all of which are awesome and look incredible. 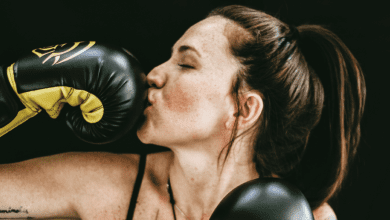 Although one of the most expensive items on our list, there’s a reason why so many martial artists have dubbed them the best shin guards for Muay Thai and MMA. 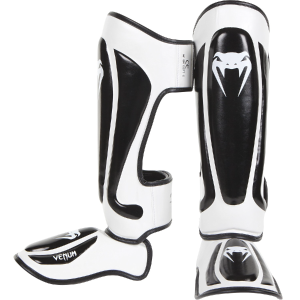 If you can’t tell by looking at them, the Venum Predator’s are one of the most protective Muay Thai and MMA shin guards around. They’re manufactured using a blend of high quality synthetic leather and buffalo leather that offers wearers unrivalled durability. These high quality materials mean that the Venum Predator’s have an extremely long lifetime and won’t have to be replaced for many years to come. The curved design of the shin guards allows them to fit perfectly round your leg without slipping. Similarly, the curved foot padding protects the entirety of your foot, not just the in-step. The padding is made using high-density foam that is designed to absorb the shock of high-powered blows. Located at the back of the shin guards are two Velcro straps that fasten them securely in place. 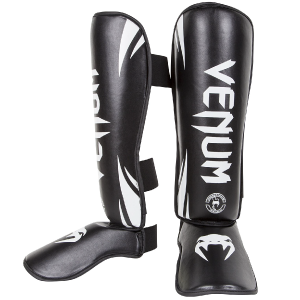 Overall the Venum Predator’s are one of the best Muay Thai shin guards and are perfectly suited to a striking based MMA fighter. The only downside to these bad boys is the cost. Being one of the higher quality products available they are relatively expensive, but as with all Venum gear they’re well worth the cost. 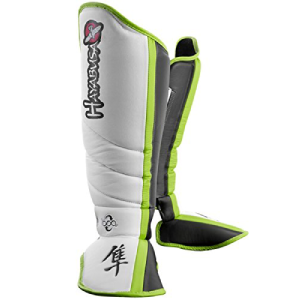 As the name suggests, these shin guards by Hayabusa are designed specifically for striking. By offering full leg, ankle and foot protection, you can throw and block kicks with ease and pain free. At first glance they may look a bit chunky and rigid, however speaking from experience I can inform you that they're surprisingly lightweight. They do however have a bit of a ‘break in’ period, where they may be a bit stiff to begin with, but after a couple of sessions they loosen up and feel amazing. The Hayabusa striking shin guards feature a double strap that securely fastens to your leg and prevents them from coming lose. Once you start to sweat a lot they do slip a little bit, but no way near as much as other models. The strap stays together really well and rarely need adjusting, which is great as it allows you to focus on your training. The only real downside to these is the price, however that’s to be expected with a reputable brand such as Hayabusa. These things are built to last and despite costing just over $100; you won’t have to purchase another pair a long amount of time. Not many brands can rival Hayabusa in terms of quality, protection and practicality. There is no doubt that these are one of the best MMA shin guards that money can buy. Twins Special is another well known and trusted brand of Muay Thai shin guards, often a popular choice amongst native Thai fighters, who of course are amongst the best in the world. The Twins Special shin guards prioritise protection over size, opting for larger padding than normal. As such, the Twins Special shin guards are common amongst those who are new to Muay Thai and are looking for a protective set of guards. Although large in size, they are made using lightweight fabrics and materials that do not restrict the wearer’s ability to move their leg. The two Velcro straps hold the shin guards in place and prevent them from coming loose. These two straps allow the shin guards to be equipped and removed with ease and can quickly be adjusted if need be. Not only are the Twins Special leg guards amazing for Muay Thai, but they’re also one of best MMA shin guards as well. 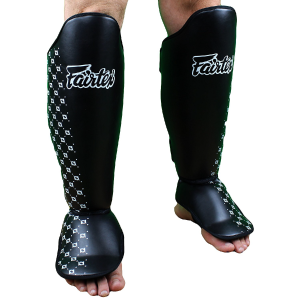 Up next we’ve got the Fairtex Pro style shin guards. What makes these one of the best Muay Thai shin guards? Well, you’re going to struggle to find better value for money shin guards anywhere. 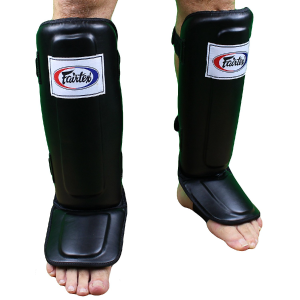 Although priced relatively inexpensively, the Fairtex shin guards offer a high amount of protection as well as a long life span. Unlike most other low priced shin guards, you don’t have to keep adjusting them every five minutes. As I mentioned earlier, this is a tell tale sign of low quality shin pads and should be avoided. Of course, as you begin to sweat they will slide around a little bit, but so does every other pair of shin guards out there. At the end of the day, the Fairtex Pro Style shin guards do what they say on the box, nothing more, nothing less. Admittedly they’re not the best looking, but they’re built to a high standard, are very affordable and last for a long time. What more could you ask for? The Hayabusa Tokushu grappling shin guards are some of the most durable and versatile shin guards designed for mixed martial artists. These shin guards are nothing short of spectacular, sporting a breathable sleeve design that keeps the guards fastened securely to the wearer’s leg. This breathable sleeve also helps prevent your sweat from effecting your foots traction with the floor and stops you from slipping. If you’ve ever worn a cheap pair of shin guards that are bulky and don’t make use of breathable fabric, you’re probably aware that you get sweaty pretty quick. This in turn can cause you to slip, which of course is detrimental when grappling. The sleeve is made using neoprene materials that are both comfortable and provide extra traction with the ground. The shin guards themselves make use of multiple layers of shock absorbing foam that greatly reduces the impact of a blow. These are also incredibly lightweight and as such do not have any adverse effect on the speed of your strikes. The only reason these don’t have the number one spot is because of their price. Being one the most advanced grappling shin guards in the world, they unfortunately cost a fair amount. 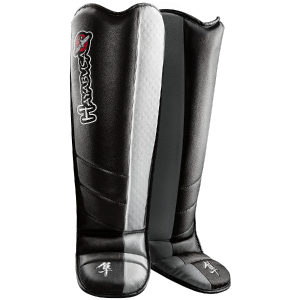 Luckily, the design and overall quality of the Hayabusa Elite shin guards more than justify their high price tag. For example, they’re manufactured using the highest quality premium full grain leather that is not only one of the most lightweight materials ever used in shin guards, but is in a class of its own in terms of protection. The shin guards feature breathable fabric that prevents the build up of sweat, which can cause your feet to sleep and the shin pads to rotate around the leg. Few other guards can rival the Kanpeki shin guards’ ability to protect the wearers’ leg without impacting their speed or mobility. The ergonomic design of the shin guards allow them to attach perfectly to your leg and offer an all round protection that cannot be matched by any other grappling shin guards. 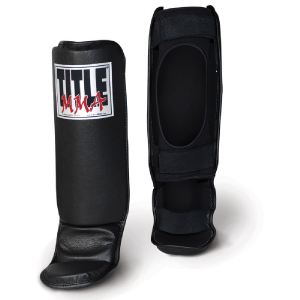 So we’ve made it to the final item on our list, the Tittle MMA Grappling shin guards. Although they aren’t cheap, they’re certainly not expensive either. If you’re a beginner to MMA and don’t want to spend a lot of money, then the Title MMA shin guards could be your best bet. The shin guards feature a dual hook and loop closure that keeps them fastened tightly to your leg. 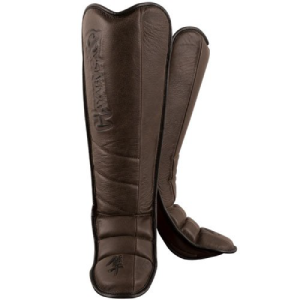 They’re also manufactured using high quality genuine leather paired with neoprene fabric. As I’ve mentioned earlier, you will find with most shin guards at this sort of price range tend to slip and rotate around the leg when you begin to sweat. Of course this can’t be avoided completely, but the Title shin guards rarely need adjusting and feel like a much more expensive piece of gear than they are. To summarise, the Title MMA Grappling Shin guards tick all the boxes. They’re affordable, well designed and offer great protection. They’re nothing less than an absolute bargain. Check out the video below by Jeff Curran on how to put on your MMA shin guards. If you're new to MMA, it can be hard to know what to look and what separates the best MMA shin guards from the bad ones. Below are some aspects that you should consider when looking to purchase a pair of MMA shin guards. When looking for the best MMA shin guards, you should pay close attention to the overall size and weight of the guards. If the shin guards are bulky and heavy, they will have a direct impact on the speed of your strikes. A good pair of shin guards will protect your legs, whilst still allowing you to move freely and quickly. Cheap, un-branded shin guards tend to be over-sized and made of heavy materials. This will in turn make your leg movements slower, less powerful and also affect your legs range of movement. The whole point of buying shin guards is to protect your lower leg, so of course this I is a major thing to consider when looking to buy a pair. You will often find yourself in a toss up between protection and size. More protective shin guards will often be larger and heavier than a less protective pair, and therefore have a direct impact on your mobility. 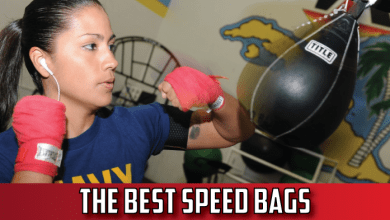 If you’re new to MMA I suggest you make protection a priority over speed. This is because at first you should concentrate on learning technique and not focus on speed entirely. The added protection will also give you the confidence to be more experimental during sparring and have piece of mind that you will no get hurt. The quality of your shin pads will tie in closely with the material used. Genuine leather products last significantly longer than synthetic leather; however tend to me more expensive. Having breathable fabric is also another massive bonus, as it prevents the build of up sweat. This in turn helps to prevent you from slipping and also helps to reduce the odour of the shin guards. The use of neoprene material is also common amongst MMA shin guards as it creates traction between your foot and the ground, preventing you from slipping. As I mentioned earlier in this article, you get what you pay for. If you opt for a cheaper pair of shin guards, be prepared to constantly adjust them and to be buying another pair in the not too distant future. More expensive shin guards from trusted brands such as Hayabusa tend to last far longer than cheap unbranded products. If you find yourself in a constant battle adjusting your shin guards, the chances are they aren’t the best quality. If you’re new to MMA, stick with the big, well known brands such as Hayabusa and Venum. They’ve been making and perfecting these products for years and know exactly what they’re doing. Below are some popular brands who manufacture some of the best MMA shin guards. Hayabusa are dominating the martial arts market with their insanely good products. The design team over at Hayabusa have produced some award winning products that push the boundaries of martial arts innovation. Their products are known to last for an extraordinary amount of time and although costing more than other brands, are great long-term investments. Venum are well-known for creating long lasting products that are extremely affordable. They manufacture a range of MMA gear including shorts, head gear, gloves, shin guards and mouth guards. Over the years of creating these products, Venum have become on of the market leaders and innovators for all fight gear. Fairtex specialise in manufacturing high quality Muay Thai gear; however have started to adapt their products for MMA since its recent rise in popularity. Their products tend to be middle of the range and an absolute bargain. Very few companies produce such high quality gear for these types of prices. 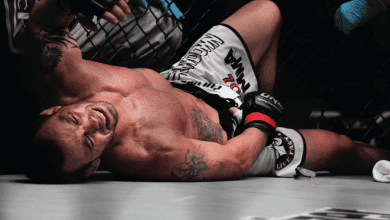 We’ve made it to the end of our article on the best shin guards for MMA. I hope that you’ve found it helpful and if you’ve go any questions, please feel free to comment below.